Many of the hallmarks of MND are hidden within the term Amyotrophic Lateral Sclerosis. Refers to the fact that our neurons and body are connected by tracts of nerves that run down both sides of the spinal cord. These tracts are one of the sites where neurons undergo degeneration. Refers to the scar tissue-like appearance of the spinal cord after these tracts of nerves and neurons degenerate. Given these details, the term ALS is widely adopted in other countries, as it demonstrates the impact of MND on the body. The neurones that are affected in MND form part of a very intricate communication network. 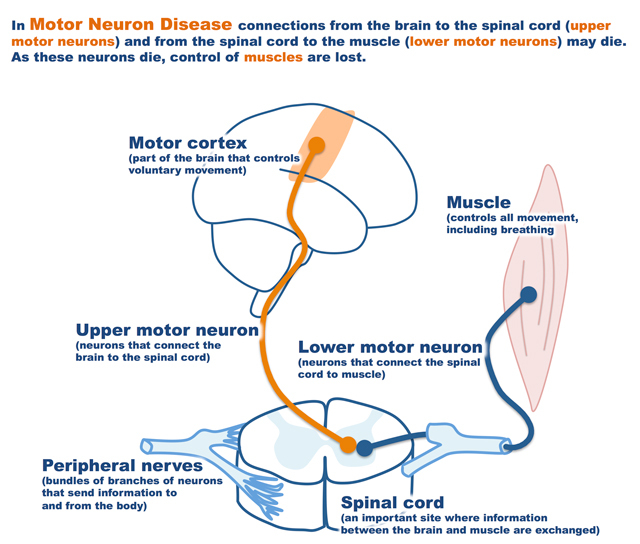 Upper motor neurones (UMNs): in the motor cortex of the brain send their projections through the brainstem (the hub at the base of the brain where messages between the brain and the body are controlled) and into the spinal cord, where they form connections with the lower motor neurones. Lower motor neurones (LMNs): in the spinal cord send their own projections out to the muscle to form a connection that is critical for the muscle to receive chemical signals that drive muscle contraction. When the neurones begin to die, the muscles that they control can no longer receive messages from the brain. The muscles become weaker and weaker, and eventually stop working, leaving people motionless, unable to talk, and trapped in their bodies. In most cases the mind is left intact, but some patients have MND and a form of dementia known as Frontotemporal Dementia (FTD)1. 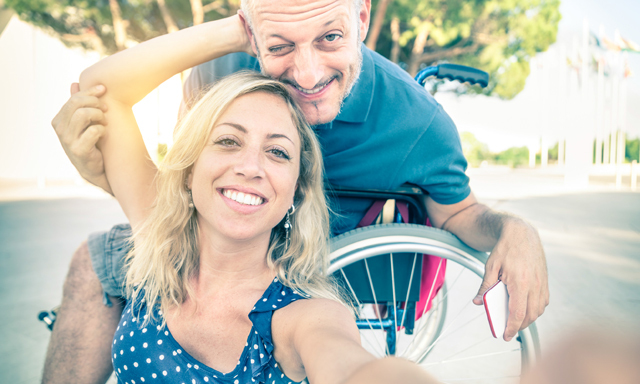 In MND, no one person is the same – where the weakness first starts, how the weakness progresses, and the rate at which the weakness progresses is different from person to person. Although some people can live a long time with MND, the average life expectancy is 27 months following diagnosis. If the general practitioner suspects that there is a neurological problem, they may refer the person a neurologist. Neurologists depend on a number of signs, patterns, and techniques to diagnose MND. They look for clinical signs when examining a patient, evidence of gradual progression and worsening of symptoms over time, and they use nerve conduction studies and electromyography tests to assist with the diagnosis. Because a lot of other neurological conditions can look similar to MND, neurologists also need to ‘rule out’ other potential diagnoses before confirming a diagnosis of MND2. Confirmation of diagnosis of MND takes on average, 10 to 18 months from symptom onset3. Ferrari, R. et al. FTD and ALS: a tale of two diseases. Curr Alzheimer Res. 2011 May; 8(3): 273–294. Kiernan M.C., et al., 2011. Amyotrophic lateral sclerosis. Lancet. 377 (9769): 942–955. Deloitte Access Economics report: Economic Analysis of MND in Australia 2015 report for Motor Neurone Disease Australia, Deloitte Access Economics, Canberra, November. Factor-Litvak et al. Current pathways for epidemiological research in amyotrophic lateral sclerosisALS FTD 2013; 14 (Suppl. 1): 33–43.